This set features the last Canadian circulating gold coin as issued by King George V. Both of these original gold coins as housed in this special presentation set contain gold mined in the Klondike region of the Yukon in North West Canada which became the centre of one of the world’s most famous gold rushes in 1896. Issued during the year in which the Versailles Treaty was formalised, the 1919 edition depicts King George V in a portrait crafted by Edgar Bertram Mackennal RA, an Australian designer whose initials can just be seen at the bottom of the truncation. The small ‘C’ mintmark seen under the horse on the reverse confirms this as a coin of Canadian origin. As had been the custom since 1817, the obverse of the coin featured an engraving of St George slaying the Dragon by Benedetto Pistrucci. 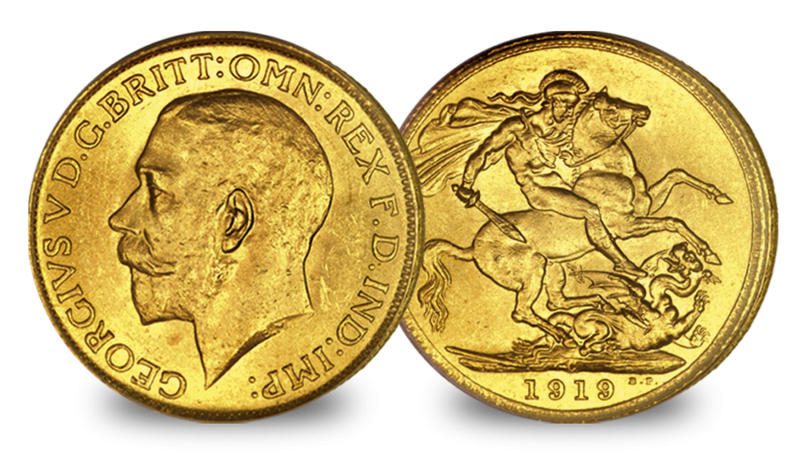 The 1914 edition was the last to be issued, though most of the 1914 $10 Ottawa Mint Gold coins remained in the vaults of the Bank of Canada for seven decades before being made available to collectors in 2012. 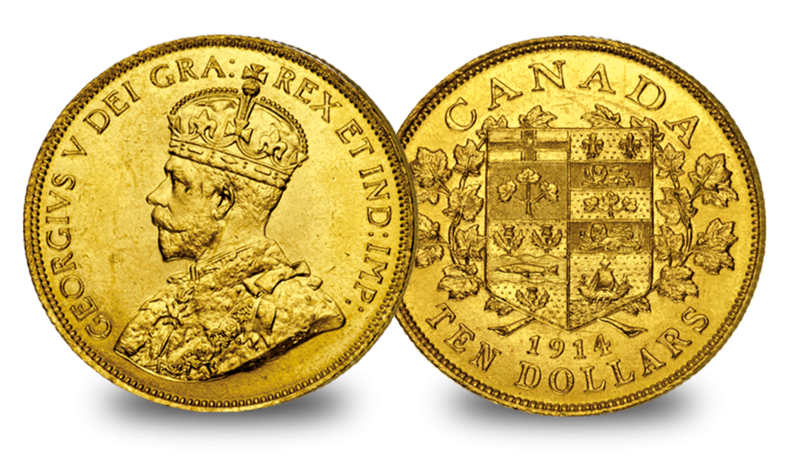 Even without its First World War associations, the 1914 $10 Ottawa Mint Gold Coin is a handsome and historic coin in its own right. It is a truly Canadian coin in every sense, as it is composed almost entirely of gold from the Klondike region of Canada.